‘It’s abstract Mummy, art can be anything you want it to be.’ my five year old declared as she presented to me her latest drawing. What a perfect age, completely open to the artistic process whereby a piece of work can provoke ideas and thoughts that are not predetermined by life experiences and contexts. Art to her is simple – it fuels her imagination. I have the joy of working in a contemporary art gallery, traditionally a quiet and reflective space – a space which might not immediately spring to mind when considering an afternoon outing with your little one. Understandably these spaces can appear daunting to some, and often suggest a set of unspoken ‘rules’ in relation to how a child might be expected to ‘act’ around the ‘art’. It may appear that these environments are at odds with your bouncy, inquisitive, keen-to-touch, curious and overly energetic pre-schooler? And a visit to the local park may be a more straight forward option? And clearly what four year old wouldn’t want to kick their way through the leaves of Anna Barribal’s floor installation or deconstruct a precariously balanced Harlequin Cube by artist Gareth Jones? But beyond the perfectly presented ‘do not touch’ paintings and plinths, the delicate installation quietly observed by a watchful invigilator or those crisp white cube walls just asking to be drawn on with a crayon, what you have at your fingertips are ideas – new ways of thinking and of course the artist’s, often playful, take on the world around them, and us. Perhaps it’s the role of the artist and their relentless experimentation with their chosen materials or subject matter which is not so dissimilar to our children and their desire to experiment? Mastering something may take time but as we know young children’s brains are programmed, in much the same way as the artists, to try their hand again and again, often seeking the same answer of the same question. So what better environment in which to support our little ones through these thought processes? 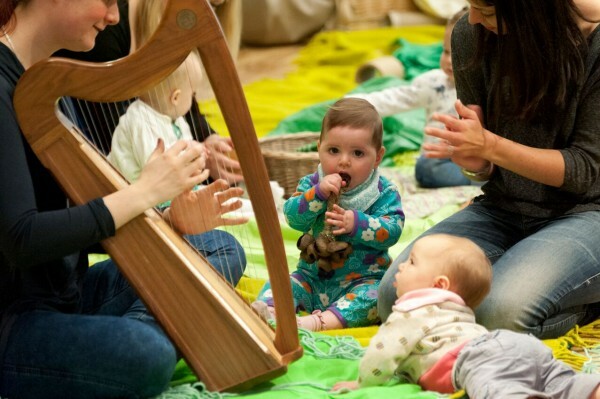 In 2010 we set up a new Early Years Programme within our venue with the belief that access to high quality cultural opportunities with an emphasis on family focused engagement, must be available from birth. These experiences were to be the building blocks on which babies and toddlers could create their own journey of discovery. Having not yet experienced the wider world, and with so much of contemporary art relying upon the viewer to bring the work to life through their own experiences and self-made connections, we were curious as to how the opportunity would result in meaningful engagement with the work. At this point our young visitors took the lead. We were quick to allow ourselves to take a back seat and sure that, in time, they would guide our decision making. We watched on as they explored, engaged and connected with our visiting artists, our exhibitions and our spaces in ways that we hadn’t imagined – and their parents soon followed suit. I’d perhaps argue that this age group have some of the most raw and personally ‘owned’ experiences enjoyed by our audiences. In fact, these meaningful ‘experiences’ can be discovered in galleries and museums up and down the country. Take The Whitworth whose work we are keenly following, and who equally believe in starting young. Their work , ‘informed by children’s inquisitive nature and capacity to imagine on the one hand and the gallery’s collections, artists and their practice on the other’ celebrates the art of engaging children in learning from birth and their exciting programme for parents and babies offers plenty of food for thought. And to the South we have the fantastic Tiny Towners in Brighton, proving the capabilities of our very young visitors when it comes to exploring their displays. In his recent blog Jack Shoulder, The Towner Gallery’s Learning & Participation Assistant, guides you through taking your own first steps towards opening up your venue. Their approach has evolved a thoughtful Early Years Programme by working with practitioners from the local Children’s Centres in order to ensure high quality skills sharing and relationship building with audiences. Observation of children’s engagement and learning has been key when developing activity and adapting their spaces to foster opportunities for child-led learning and play. And it’s the opportunity to ‘learn from’ that interests me the most. Allowing myself to be guided by both my own children and our young gallery visitors has significantly impacted my own thought processes. A recent opportunity to observe a group of Foundation Stage children on a visit to the How to Construct a Time Machine exhibition showed me that we were heading in the right direction. The exhibition had everything a young mind could wish for - except this audience understood very little about the concept of ‘time’ and the notion of possible time travel. In a conscious departure from the formulaic approach of talk, tour and workshop we tried out something new. We created an environment in which the visiting school children could retain complete control of their own learning and self-discovery. It was a Monday so the gallery was closed to the public and the group of four and five year olds could literally ‘own’ the space. Electrical tape created simple pathways around the concrete floors to help mobilise the group, a selection of resources were placed in each space (torches, OHP, mark making materials and cardboard) and supporting staff were prepped to both blend into the background and be on hand to support the children as necessary. Most significantly the teachers, artists and supporting parents were asked to refrain from leading the exploration and, following a brief welcome and introduction to the team, children were simply encouraged to head off and explore. What struck me as the last of the four thirty minute sessions drew to a close was the level of engagement made possible through simple play structures. I was mesmerised by two children as they held large sheets of cardboard in front of the artists film The Time Machine in Alphabetical Order projected in the Cube Gallery and then, moving forwards and backwards, attempted to understand the physical nature of the projection process. How did the machine on that wall throw an image to that wall? They laughed as they ‘captured’ film on their cardboard and moved it across the room. They skipped about excitedly and invited friends to take part, showing each other how to use the cardboard. Then suddenly they stopped, sat down and, intently watching the film, began mimicking the strange new language they had tuned in to – they listened, they repeated, they took turns, they observed, they engaged – and then they returned home to share their learning with their families. 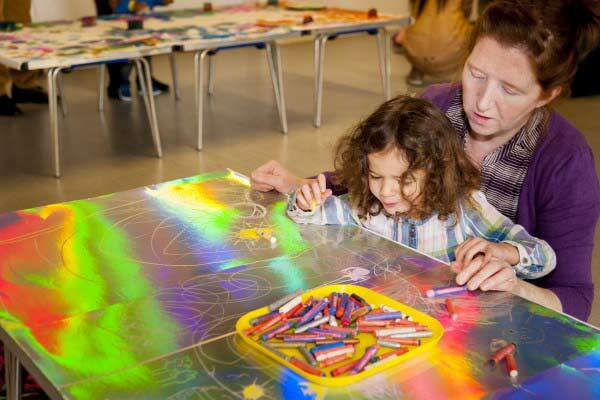 MK Gallery engages an average annually of 1500 children under 5 and their parents in the Start the Art programme. The Learning Team is currently developing a new dedicated programme specifically for Foundation Stage children, working in consultation with teachers, headteachers, parents and arts practitioners to enable high quality and meaningful experiences for children aged four and five to engage with contemporary art. MK Gallery’s exciting capital expansion is set to transform the venue and includes a new learning space, café, garden and artist designed playground with a view to improving the venue’s accessibility, comfort and appeal for children and their parents.